Our solar system is a family of planets, dwarf planets, comets, and asteroids orbiting our Sun, each harboring clues of our common origins, with their disparate compositions and characteristics. How do scientists discover those secrets? Ancient civilizations studied the skies and noted the strange travelings of "wanderers," or "planetes" in Greek, which seemed to move against the background of familiar constellations. Telescopes allowed astronomers to view the surfaces of planets; spacecraft instruments now allow us to infer information about the interiors of planets. Instruments like radar, orbital mapping devices, and others that detect wavelengths of light invisible to the human eye are some of the tools that allow spacecraft to explore other worlds. NASA's Juno mission to Jupiter will investigate Jupiter's interior, atmosphere, magnetosphere, and origins. By discovering clues about Jupiter's unique personality, the Juno mission will reveal answers about our solar system's birth. This artist's rendering shows the Juno spacecraft in front of Jupiter, where it will arrive in 2016. Credit: NASA. NASA's Juno mission to Jupiter launched in 2011 and will not only investigate the deepest mysteries of Jupiter's unique personality, but will also plumb the secrets of our solar system's origins. Like all families, the members of our solar system family share a common origins story. Their story started even before our solar system formed 4.6 billion years ago. The first stars lived out their lives and eventually exploded, sending "star stuff" out into the cosmos. That original stellar material was recycled as another generation of stars, and many of these, too, exploded at the end of their lives. Our Sun is thought to be a third–generation star and our entire solar system is made of the recycled star stuff of previous star generations. Our Sun is a granddaughter of the very first stars! Our solar system began forming within a concentration of interstellar dust and hydrogen gas which contracted into a solar nebula, forming the proto-Sun and planetesimals that eventually joined into planets. Check out how the planets formed and changed through a series of images at the "Evolution of our Solar System" timeline. Temperatures were too high in the inner solar system for lightweight materials or “volatiles” such as water and ammonia, to condense. In the outer regions of the solar system —beyond the "frost line" — it was cold enough for these gases to condense onto the growing giant planets. The outer planets collected volatiles as well as rocky materials, becoming gas giants, while the inner planets formed mainly from rocks and metals. Credit: Lunar and Planetary Institute. Scientists still have many questions about our solar system's story, and Juno will help scientists begin to piece together the missing clues: How did the planets form so quickly (at least in cosmic terms)? Did the planets form in their present locations, or did the giant planets form closer to the Sun and, through complex gravitational interactions, migrate to their orbits of today? At more than twice the mass of all the other planets combined, Jupiter is the patriarch of our planet family. It grew large enough to capture and hold onto the materials of the solar nebula, so its mixture of about 90% hydrogen and 10% helium by percent volume (with some methane, water, and ammonia mixed in) reflects the composition of the primordial mixture that produced all the planets. Yet, its composition is not exactly like the primordial mixture, leaving scientists uncertain about how exactly Jupiter, and by extension, the solar system, formed. Better understanding Jupiter's traces of methane, water, and ammonia will help scientists piece together exactly how a collection of gas and dust came to form the planets we see today. Juno will use sophisticated instruments to spy deep into Jupiter's atmosphere in wavelengths of light invisible to the human eye, and it will gather information about the trace components water and ammonia. By measuring how its orbit is very slightly altered by the gravity of the planet, Juno will infer just how massive Jupiter's core is, which will provide additional clues about how Jupiter captured heavy enough materials in its infancy to grow so large. The very stuff of Jupiter holds clues to understanding the story of our solar system's birth! Jupiter's Atmosphere –Jupiter's clouds shroud a very turbulent place. The immense pressure of the planet's bulk crushed the interior as it formed (and possibly still does as Jupiter continues to contract) and the resulting heat is still leaking from the planet. Jupiter is far from the Sun, but this internal heat warms the planet and plays a major role in its weather. 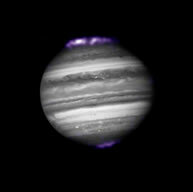 Jupiter radiates twice as much infrared energy as it receives from the Sun! Its core temperature may be about 43,000ºF (24,000°C) — hotter than the surface of the Sun. 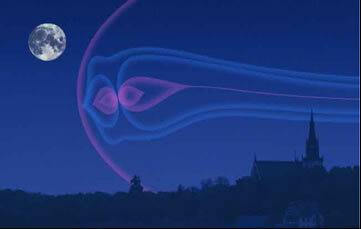 This heat leaks up through the liquid metallic hydrogen and liquid hydrogen layers to supply energy to the atmosphere. Like a pot of soup on a hot stove, atmospheric gases boil up from the warm bottom layers to the cooler upper layers; temperatures are–261°F(–163°C) at the top of the atmosphere. Juno will map the atmosphere's temperature at different depths. 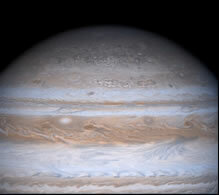 Convection drives violent weather on Jupiter. Heat leaks outward from the planet's interior, causing atmospheric gases boil up from the warm bottom layers to the cooler upper layers. Credit: NASA. While it orbits the Sun only once every 12 years, Jupiter spins on its axis once every 10 hours. The rapidly spinning planet generates five jet streams in each hemisphere that produce Jupiter's unique banded appearance. Earth has only about four dynamic jet streams, two — sometimes three — in each hemisphere, which all travel from west to east. Wind speeds are high, up to 330 miles (530 kilometers) per hour, and alternate direction from eastward to westward with latitude. Lightning, produced as ice particles within storms rub past each other, is frequent. The Great Red Spot is a massive storm system larger than the diameter of Earth that has been raging for at least several hundred years. Jupiter has five jet streams in each hemisphere that flow in alternating directions at speeds up to 330 miles (530 kilometers) per hour. 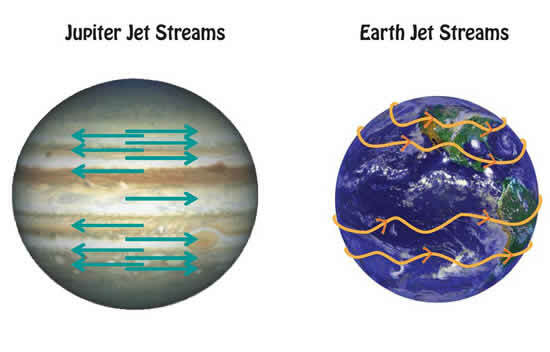 Like on Jupiter, Earth's rotation generates jet streams that influence weather patterns. However, Earth has only about four dynamic jet streams, two — sometimes three — in each hemisphere, which all travel from west to east. Planet images are not to scale. Credit: Lunar and Planetary Institute. This movie, made up of Cassini spacecraft images, shows bands of eastward and westward winds on Jupiter from the perspective of looking down at Jupiter's north pole. Long-lasting storms are seen to drift in opposite directions inside alternating bands. Credit: NASA/JPL/Southwest Research Institute. 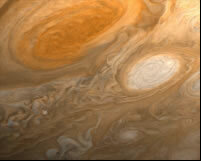 Storms, such as the persistent Great Red Spot, rage throughout the atmosphere. The Great Red Spot is a massive storm system larger than the diameter of Earth that has been raging for at least several hundred years. Credit: NASA. Jupiter's Magnetosphere and Interior – Another shroud envelops Jupiter, but this one is invisible to our eyes. Like Earth, Jupiter has a magnetic field. Earth's magnetic field is familiar to us through its effects: our compasses point to the magnetic poles; it protects our atmosphere from the blast of the solar wind; and particles interact with it to produce the auroras, or northern and southern lights. Similarly, Jupiter’s magnetic field is detectable with compasses. It also produces beautiful auroras! Jupiter's large magnetic field interacts with the solar wind to form an invisible magnetosphere. If we were able to see Jupiter's magnetosphere, it would appear from Earth as in this artist's depiction, larger than the Moon in the sky. Credit: NASA. Both magnetic fields originate from processes deep in each planet's interior. 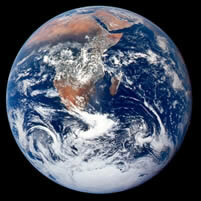 Earth's is generated from the electric current caused by the flow of molten metallic material within its outer core. 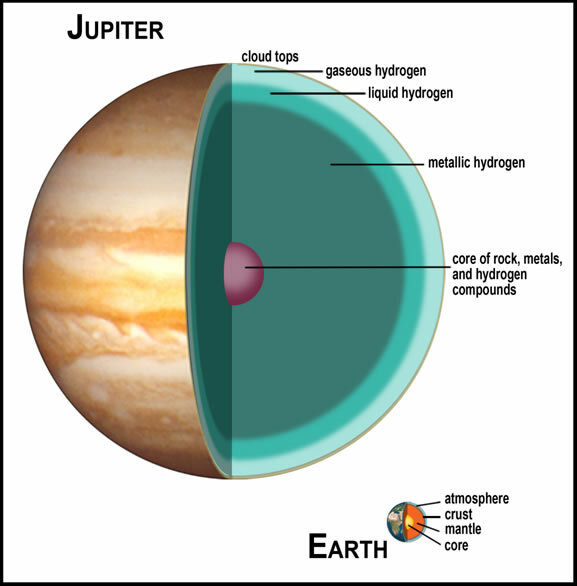 Jupiter's gases are crushed to such incredible pressures that they are forced beyond the common states of liquid, solid, or gas that we find on Earth. One such a layer inside Jupiter is metallic hydrogen, and the electric current caused by swirling movements in this substance produces a magnetic field so large that its tail end ("magnetotail") extends past the orbit of Saturn. Liquid metallic hydrogen probably makes up most of Jupiter, as seen in this cut-away view of the plane's interior. 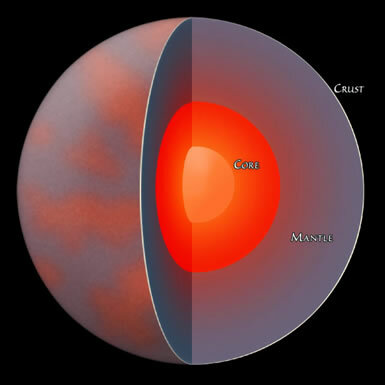 There may be a dense core at the planet's center, and it may be slightly larger than the whole of Earth. The thick atmosphere merges seamlessly with a liquid hydrogen layer; there is no solid surface on Jupiter. A similar cut-away view of Earth's interior shows its relatively thin atmosphere and dense interior. Both planets have layers and a core, but the composition of those layers is remarkably different. Credit: Lunar and Planetary Institute. Juno will map Jupiter's magnetic field. 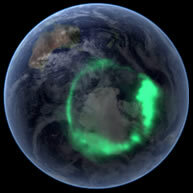 Its unique polar orbit will carry it above the poles to study Jupiter's auroras and how the magnetic field slams invisible charged particles into the atmosphere to produce the beautiful lights. Juno will measure the charged particles and the electric currents they create along the magnetic field lines. 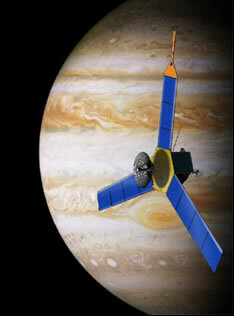 Juno will also "listen" for the radio signals given off by these particles as they move through the magnetic field. Its special "eyes" — an ultraviolet spectrometer — will "see" the aurora in a wavelength of light invisible to our eyes. JunoCam will take pictures of the planet, which scientists and students will use to study the poles. Jupiter's Moons – Jupiter has its own family of at least 63 moons. Ganymede, the largest of Jupiter's moons, is bigger than the planet Mercury. Scientists suspect that the tiny moons Adrastea, Metis, Amalthea, and Thebe have slowly shed particles to create Jupiter's thin, dark rings. In the inner solar system, a distinct set of sibling planets formed from the primordial nebula: the inner, terrestrial planets Mercury, Venus, Earth, and Mars. These relatively small, rocky, dense planets lack the thick shroud of gases surrounding each of the giant planets, because they are heated by their closeness to the Sun and the blast of solar wind from the early Sun stripped them of their ices and gases. The process of accretion that formed the rocky planets — bits and pieces gradually clumping together into larger and larger bodies — also left its mark on the planets and their moons. We can see craters on their surfaces. Earth's Interior and Magnetic Field – Early in their histories, the accumulated heat from accretion, the continuing decay of their radioactive isotopes, and the energy of countless impacts made the terrestrial planets hot enough to separate into distinct layers (differentiate): Dense materials, like iron and nickel, sank to form cores; medium-density, rocky silicate materials formed mantles; and lighter rocks rose to the surfaces and cooled to form crusts. Earth's outer core is molten. Flow of this hot metallic material produces an electric current that generates our magnetic field. As the inner planets formed, they heated up. Their interiors melted and reorganized into layers of different densities. Melting was caused by heat from impactors striking and accreting, the sinking of heavy materials to the center, and the decay of radioactive elements. This process caused the rocky planets to have dense, metal-rich inner cores, less-dense mantles, and outer crusts formed from the lightest materials. Credit: Lunar and Planetary Institute. 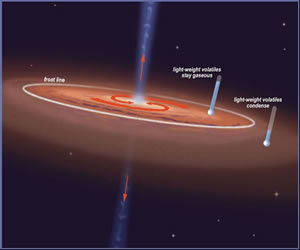 Earth's Atmosphere – Over time, these planets regenerated their lost atmospheres though volcanic outgassing, with the larger planets, Venus and Earth, holding onto thicker atmospheres. Mars also regenerated an atmosphere, but the smaller planet's interior cooled more quickly. It is no longer outgassing at a sufficient rate; in addition, it no longer has a magnetic field to prevent the solar wind from stripping its gases away. Under the protection of their planet's magnetic field, Venus and Earth each accumulated comparatively thick atmospheres. Earth's was further modified by photosynthesis. Distinct from their giant gaseous cousins, however, the inner planets are mainly made of rock. We are still uncovering the secrets of our own rocky inner planet, but we use it as the standard of comparison for our exploration of all other planets. Earth spins on its axis once a day and orbits the Sun once a year. All other planets are hot or cold compared to Earth's temperate surface temperatures, which range from about –125° to 130°F(–87° to 54°C). Our atmosphere traps energy from sunlight, creating a greenhouse effect that warms the surface. It also moderates the climate and protects the surface from some damaging components of solar radiation. The rotation axis is tilted, giving Earth its seasons. Earth has water, rock, and tectonic cycles, which are important for renewing nutrients. Earth is the only known planet with life, but we continue to search for other areas in our solar system that might harbor primitive life. Unique among all its siblings, it has a single, comparatively large natural satellite — the Moon. The other members of our solar system family have their own secrets and delightfully diverse personalities. The following sections provide a brief overview of the other giant planets, the inner planets, as well as the smaller asteroids, dwarf planets, and comets that orbit our Sun. In addition, a table summarizing important statistics can be found in Family Portrait ... in Numbers. Further information: These presentations are made by NASA scientists and engineers, to provide background information for program providers, and not to be used directly in youth programs. These external resources are not necessarily 508 compliant. Explorers "Guide to the Solar System"
This NASA presentation is available to download in PowerPoint format and use in programs. The site also offers a suggested script as well as supporting activities.